Russia is the world’s largest country, steeped in history and dramatic landscapes; it is also the host of the 2018 FIFA World Cup. With crowds of football fans gathered for the year’s biggest sporting event, eyes from around the world are focused on Russia, as we wanted to highlight what the country has to explore –whether you’re a football fan or not! From historic cities to idyllic countryside and majestic snow-capped mountains, Russia is fascinating country of many contrasts. As the inspiration behind many great pieces of art, literature and music, Russia is home to intriguing museums, stunning palaces and impressive landmarks. The nation is also known for scenic national parks, epic train rides and even subtropical beaches. 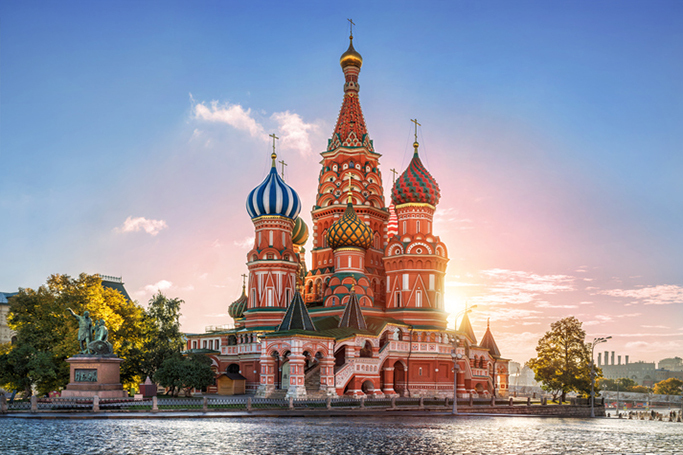 Russia’s capital Moscow is home to history, iconic landmarks and some fabulous art and culture. The city has world-class galleries, expensive restaurants and shops and an exciting nightlife scene. The Red Square and the Kremlin are among the must-see historic sights, as the cities many museums are also a huge attraction. Kizhi Island is located in the heart of Lake Onega in the Republic of Karelia. It is home to Church of the Resurrection of Lazarus (the oldest wooden church in Russia) and the Kizhi Pogost site, with its impressive 22-dome Transfiguration Church. Visitors must experience the island’s wooden architecture and ancient rural settlements, alongside the island’s natural beauty. St. Petersburg is regarded as Russia’s most European city; it is a cultural hub of libraries, museums, theatres and galleries, as well as cafes, underground clubs and an edgy art scene. The city is full of eye-catching architecture, canals and elaborately decorated churches. It is best to visit St. Petersburg in summer for the White Nights festivals, midnight sun and traditions. Sergiev Posad is a part of the must-visit Golden Ring cluster of ancient towns, located north east of Moscow. The Golden Ring is an enchanting destination of medieval fortresses, domed churches and idyllic old towns which are immersed in Russian traditions and history. In particular, Sergiev Posad is famous for the Trinity Lavra of St. Sergiu, the most important Russian monastery and the spiritual centre of the Russian Orthodox Church. Vladivostok is admired for its modern architecture, an exquisite blend of European and Asian cuisine, its uninterrupted sea views, and hilly streets. The Sportivnaya Harbor is considered a lively spot in town with amusement parks in the summer. Others places of interest include the city’s main square Ploschad Bortsov Revolutsy, the Russky Island Bridge, the Arseniev Regional History Museum and the Primorsky State Art Gallery. Sochi is Russia’s largest resort destination for both summer and winter holidays, it has also hosted the 2014 Olympic and Paralympic games and 2018 World Cup matches. Sochi is situated on the Black Sea coast and offers great beaches, world-class restaurants and a vibrant nightlife. It is also a popular ski resort with the forested Sochi National Park in the nearby Caucasus Mountains. Considered the deepest lake in the world, Lake Baikal is Russia’s most amazing nature reserve, and a UNESCO World Heritage Site, in the mountainous Russian region of Siberia. The massive picturesque lake is surrounded by hiking paths and close to the village of Listvyanka which is the perfect places for wildlife-spotting tours, ice-skating and dog sledding. Nearby city Irkutsk is also worth a visit. Kazan is one of Russia’s oldest cities and is characterised by a union of Eastern and European cultures. The city is a vibrant melting pot of religions and ethnicities that coexist peacefully on the Volga River. The Kazan Kremlin is the only surviving Tatar fortress in Russia that consists of a number of historical buildings dating back to the 10th century. Kazan also has an excellent range of bars, cafés, restaurants, and boutiques, most of them located on the lively pedestrian Bauman Street.